Konami has recently announced Yu-Gi-Oh! Legacy of the Duelist: Link Evolution is coming for the Nintendo Switch in Japan. 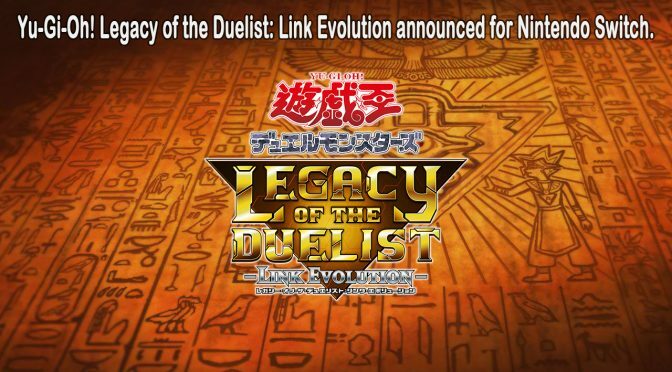 The competitive card game will allow players to duel against characters from the Yu-Gi-Oh! series as well as other players nationwide with the “New Master Rules,” which are the latest rules of the Yu-Gi-Oh! Official Card Game. We, as of yet, do not know if there will be a western release but its quite likely. Stay tuned for updates. We will have more information once the the April 2019 issue of V-Jump, which is due out on February 21st, 2019 is released. Previous PostYCS Chicago: And the Winners Are:Next Post2019 Yu-Gi-Oh! TRADING CARD GAME World Championship Date and Location Announced!